When Eve suffered a near-fatal brain aneurysm, Madonna Siles, her housemate and friend, too quickly found herself making critical short- and long-term medical care decisions without any help. When the insurance and financial resources ran out and the conventional therapy providers discharged zombie-like Eve to the homecare of a solitary caregiver, both their futures seemed hopeless. Instead of giving up, Madonna Siles drew on life experience and her marketing career to develop a rehabilitation program that harnessed the power of the subconscious mind. Using motivational techniques borrowed from the advertising world, she appealed to Eve�s subconscious to bypass the brain damage and restore normal functioning. In three short years, even the doctors were amazed at Eve�s recovery and return to a near-normal life. Part memoir, part recovery manual, Brain, Heal Thyself is a guidebook for thousands of shell-shocked individuals who suddenly find themselves having to make life and death decisions for those they love. With humor, warmth, and arresting honesty, Madonna Siles�s lively narrative closely examines not only the patient�s recovery, but also the crucial role of caregivers�and the emotional, financial, and practical pressures they face. 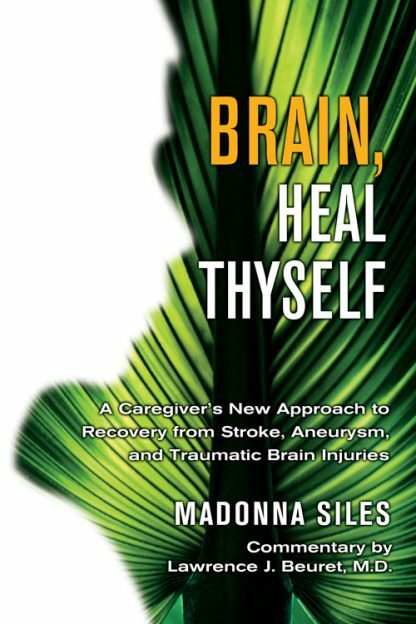 Brain, Heal Thyself is based on Madonna Siles�s experience as the caregiver of her best friend, the survivor of a near-fatal brain aneurysm and strokes. Desperate to help her, Madonna developed a holistic rehabilitation plan, drawing on her experience as a practitioner of A.A.�s 12-step program and personal knowledge of subconscious communication techniques. She learned about the amazing power of the subconscious, and the various methods to invoke its help in the healing process, primarily from her friend and co-author, Dr. Lawrence J. Beuret, M.D. Last but not least, it is Madonna�s belief that her thirty year career in the wild and wooly advertising business gave her the courage to creatively combine her knowledge and experience into the �program� that helped save her friend from an invalid existence and her own sanity as a caregiver. Madonna is a graduate of the University of Illinois, Champaign-Urbana, with a B.S. in Communications. Since 1973, Lawrence J. Beuret, MD has helped hundreds with psychosomatic (mind and body) disorders using a combination of medical and psychological therapies and subconscious communication techniques. His success has been based on a drug-free, medically-oriented approach to what is generally viewed to be a psychological condition. Throughout his career, work has attracted the attention of Chicago radio personalities and the local press. He has lectured and published medical journal articles in both the U.S. and Europe on the lifelong effects of birth trauma and methods of recalling unconscious early childhood memories. Currently, Dr. Beuret�s practice is primarily devoted to a drug-free neuro-developmental remediation for adults and children suffering from attention and learning disorders. Dr. Beuret is a graduate of Loyola University Stritch School of Medicine, and received a fellowship in pediatrics for his residency at the Mayo Clinic. He has continued his studies at the National Academy of Medical Hypnosis and at the Institute for Neuro-Physiological Psychology, Chester, England.